India-Pakistan match can leave anyone with a run for the money. The much-anticipated match between the two arch-rivals is the most delightful and satiating thing for any fan. And fans do not shy away from venting their excitement on the adventurous topic. Now, may it be a civilian or a well-known celebrity, we Indians bleed blue when the match is on. And some of us are known for getting into controversy for this. Now, that the D-day is here for India-Pakistan match as today India will face rival Pakistan for the Champions Trophy Finals, the anticipation and heat are surging. Last few days saw a massive Twitter banter between veteran actor Rishi Kapoor and Pakistani fans, or over Virender Sehwag's witty comment. 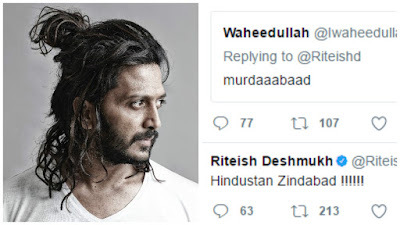 The new one to join the list is actor Riteish Deshmukh who blocked a Pakistani fan on Twitter. Message is loud and clear: Never mess with an Indian fan before Cricket.